How do I open it? There should be an icon in the top left of the screen. You can also use /cs to open/close the main UI. I will continue to add more images over time, but the two most confusing menus seem to be the main UI and the character overview, so I've started there. Displays Daily Writs progress when moused over. Opens craftable set list. Note: changing the style weight in the styles UI will change it for this list as well. The alliance wayshrines that are closest to the set selected in the craftable set list. Mouse over for teleport location and cost. The 12h and 24h timers can be started and reset as needed when you need a timer. Total items fenced today and total that can be fenced by this character. Net earnings in gold today. Does not account for the value of accumulated but un-sold items. The title and version number. Clicking on the icons for a column will cause unknown items of those traits and slot to be marked in your inventory and tooltips. Red outlines mean it is not tracking. The name of the trait with the icon of the trait item. Mousing over shows the trait item's name. The research grid, color coded by knowledge. Red = unknown by all, orange = known by some, but unknown on this, yellow = known by some, not this, but has item, white = unknown by all, but has item, green = known by this. Icon of the passive ability that determines materials you are allowed to use in that craft. Number of known (or in progress) traits for that craft. Number of unknown traits for that craft. The passive ability level for that craft. The rank for that craft. The number of actively research traits and the concurrent limit for that craft. An actively researched trait with icon and trait. The remaining time on an actively researched trait. Checkbox for tracking all traits for this character. Does the same thing as the main UI's #15, except on all items at once. Crafts with their passive level and craft rank. Research slots where applicable. Actively researched trait with remaining time. Mount knowledge is complete and shown in a consolidated form. *Implemented workaround for ZOS bug. *Fixed incorrect bag quantities on tooltips. Version 1.99.1 (CS 1.1.0.9) - Fixed guild store error. *Expanded CS UI locking option. Version 1.94 (CS 1.1.0.9) - Fixed non-set items not automatically showing as researchable after toggling mark set items. Version 1.93 (CS 1.1.0.9) - If style sorting is unchecked, fallback is now motif # instead of motif ID. *Devs: Added CraftStoreFixedAndImprovedLongClassName.GetItemQuantity() to check stored items on any character. Version 1.90.1 (CS 1.1.0.9) - Fixed changing style weight error. *Set items are now marked for research by default. *Added advanced color coded grid. Red = unknown by all, orange = known by some, but unknown on this, yellow = known by some, not this, but has item, white = unknown by all, but has item, green = known by this. *Added option to disable this change. Version 1.80 (CS 1.1.0.9) - Devs: Added CraftStoreFixedAndImprovedLongClassName.IsLearnable() to check if a recipe/blueprint is needed on any character. Version 1.79.2 (CS 1.1.0.9) - Limited Blueprint search results to reduce CS overhead. *Changed error messages referring to FurniturePreview to ItemPreview. *Devs: Added CraftStoreFixedAndImprovedLongClassName.IsResearchable() to check if a blacksmithing/clothier/woodworking/jewelry item is needed on any character. Version 1.77 (CS 1.1.0.9) - Fixed ESO+ craftbag check. *Added Jewelry to: researched, currently researching, quest window, raw materials, character overview. *Grouped choose set with wayshrine teleports. *Any empty slots change text to red regardless of unlocked slots. *Majorly reworked the character overview for optimum space usage. *Added jewelry sketches tab to blueprint window. *Fixed CS Rune header spilling over due to 1.71. *Added close button to pop up CS Rune. *Character Overview is now movable and remembers position. *Fixed Overview not instantly adjusting scroll height on new character addition. 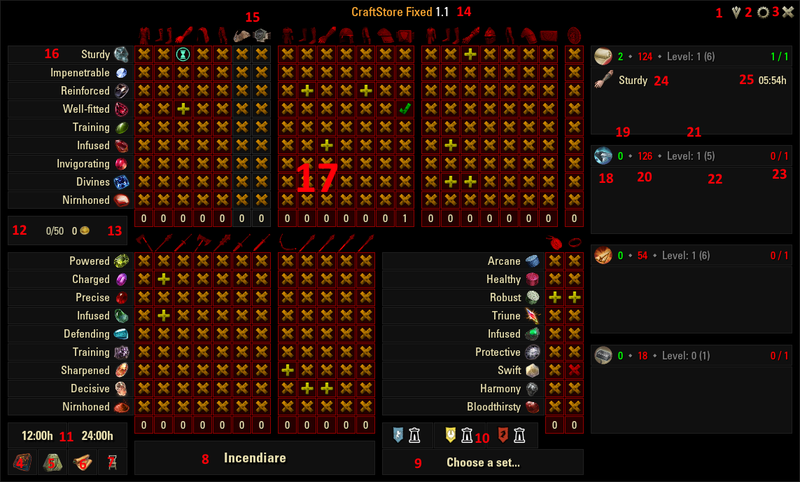 *Added inventory space to Cook and Rune. *CS Cook is now movable and remembers position. *Localized tabs in blueprint window. *Re-enabled provisioning writ fix from 1.48. *Improved German provisioning writ handling. Version 1.69 (CS 1.1.0.9) - New style. *Added nil check to CookShowRecipe. *Removed MultiCraft support due to issues. 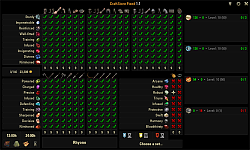 *Added toggle to existing rune level on tooltips. *Item style on tooltips is now off by default (natively added by ZOS). Version 1.65 (CS 1.1.0.9) - Smoother load with large item storage. *Repair is /csrepair. Removes and replaces missing/locked items if there is an issue. *Locked items are now replaced by a substitute without reloadui. *Locked items no longer appear in the research grid. *Fixed removed items still appearing in CS. Version 1.61 (CS 1.1.0.9) - Fixed research ignoring third party locks. *Added toggle for displaying research timer finished message to chat instead of mid-screen. Version 1.59 (CS 1.1.0.9) - Added toggle for displaying mount timer finished message to chat instead of mid-screen. Version 1.58.2 (CS 1.1.0.9) - Reworked style window hide handler. Version 1.58 (CS 1.1.0.9) - Secondary windows close on Esc press (disabled currently). *Fixed CS windows appearing in constellation screen. *Style, Rune, Recipe and Blueprint windows now remember their position. *The aforementioned now have their own xml files. *Added error message for clicking wayshrine icons without choosing a set. *Added error message for clicking wayshrine icons for unknown wayshrines. 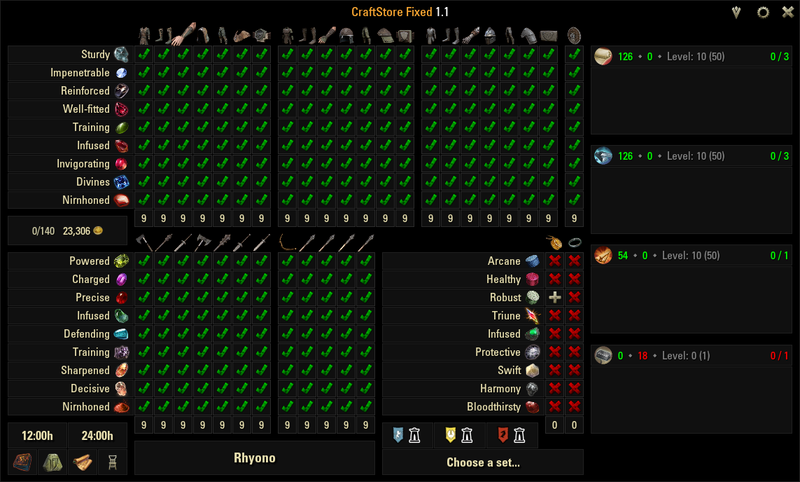 Version 1.55 (CS 1.1.0.9) - CraftStoreRune is now movable. *Integrated Master Merchant graphs into CraftStore tooltips. *Added MM graph toggle for CS tooltips. *Craftable sets tooltip dynamically updates to newest style. Version 1.52 (CS 1.1.0.9) - Added skyshards to character panel (requires SkyShards). Version 1.51 (CS 1.1.0.9) - Added skill points to character panel (requires SpentSkillPoints). *Fixed bug in glyph creation sound. *Removed toggles added in 1.46. *Provisioning writs in English are now fully accurate. *Provisioning writs in French should now work. *Provisioning writs in German will now partially work. *Removed debug output from enchanting introduced in 1.25. *Fixed marking not working on recipes in the portable list. *Fixed marks not being removed. *Added storage toggles (since removed). *Improved Item Saver criteria to decon/research only. *Changed FCOIS decon check to research check. *Recipe interface now splits miscellaneous drinks and food like the crafting interface. *Fixed both FCOIS criteria being checked. Version 1.44.2 (CS 1.1.0.9) - Improved FCOIS criteria to decon/extract only. Version 1.44.1 (CS 1.1.0.9) - Fixed Item Saver false positive bug introduced in 1.43 (Snow). *Improved riding training tracking (Snow). *Income now uses a comma for English speaking players. Version 1.43 (CS 1.1.0.9) - Added Item Saver and FCO Item Saver support for glyph decon. *Switched MultiCraft toggle to off by default. *Added style info to worn tooltips. *Added /cspurge for resetting researchable and stored items. *Added debug message to glyphs of unknown level. *Fixed glyph stack decon resuming. Version 1.38.2 (CS 1.1.0.9) - Fixed scrolling in enchanting extraction. Version 1.38.1 (CS 1.1.0.9) - Added quantity next to refinable glyphs. *Glyph extraction now sorts by level, then name, then quality. *Added right click stack extraction. *No longer prevents ESO+ users from extracting with a full bag. *Glyphs now stack in the refining interface. Version 1.36.2 (CS 1.1.0.9) - Added chat message error for trying to preview furniture without having FurniturePreview. Version 1.36.1 (CS 1.1.0.9) - Added chat message error for items FurniturePreview lacks data on. *Fixed enchanting furniture quantity source. *Slimmed down (and other tweaks) the blueprint window. *Set selection now uses styles' chest preference. Version 1.34 (CS 1.1.0.9) - Fixed scrolling in enchanting favorites. *Fixed search result anomalies in provisioning. *Blueprint search now uses hide settings. *Fixed extended scroll bar on enchanting furniture. *Fixed close all issue with enchanting. *Fixed large provisioning search error. Version 1.30.1 (CS 1.1.0.9) - Fixed style on tooltip. *Style overhaul in accordance with HotR function changes. *Reduced text for hiding recipes/blueprints for a cleaner fit. 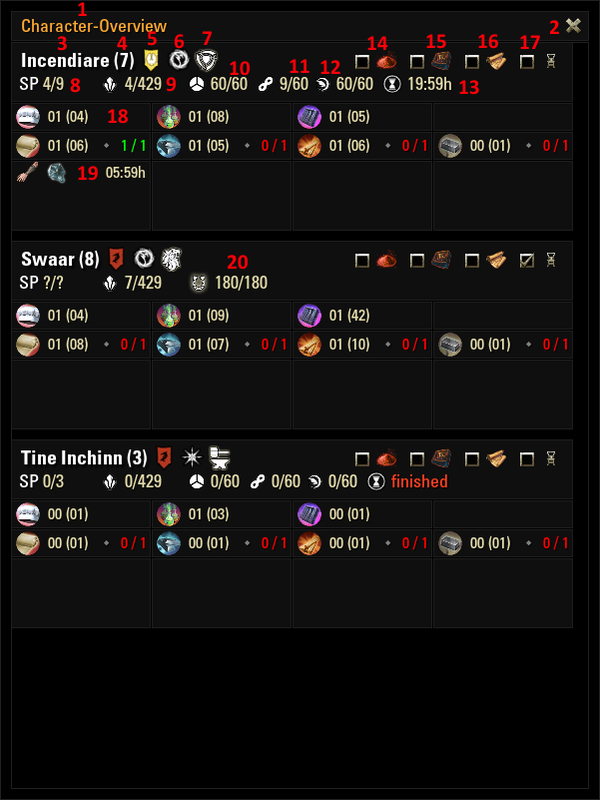 Version 1.29 (CS 1.1.0.9) - Fixed research error for equipped items. *Further improvements to research updating. *Large increase to maximum autocrafting. *Added "hide crown" option to motifs. *Small increase to maximum autocrafting. *Updated a seemingly unused piece just to be safe. Version 1.25.1 (CS 1.1.0.9) - Added debug for glyph decon errors. *Fixed another ESO+ bank issue. *Ensured research updates before trying to research something new. *Updated research failure text for all languages. *Added research support for duplicates. Version 1.23 (CS 1.1.0.9) - Fixed bank issues for ESO+. Version 1.20 (CS 1.1.0.9) - Fixed some style names that ZOS just broke for the fun of it. *Modified tracking unknown traits in the inventory. *Added a toggle to allow showing duplicate unknown trait items. *Search persists until closed or another category selected. *Search text resets to default on category selection. Version 1.16 (CS 1.1.0.9) - Fixed checkbox issue introduced in 1.07. Version 1.15 (CS 1.1.0.9) - Fixed furniture scrolling in Enchanting. Version 1.14 (CS 1.1.0.9) - Fixed some high quality items appearing uncraftable. *Added /cs and /craftstore to open/close the main window. Version 1.10 (CS 1.1.0.9) - Added support for replacing "Unused" styles with their proper name. Version 1.09 (CS 1.1.0.9) - Crown store motifs won't seep into surroundings. Version 1.06 (CS 1.1.0.9) - Fixed craftable furniture quantities. Version 1.05 (CS 1.1.0.9) - Fixed craft station recipe error. Thanks for the consideration and all the effort you put into this exceptional addon. As the PTS has started, I won't be doing any updates to the live version of CS for a month or so unless absolutely necessary. Requests can still be made, but likely would not be released until ESO 5.0. I designed Item Finder with a data dump option for cooking and furnishing recipes. I could add styles but the reason it comes from a manually created style map (that then has a function that generates the rest of the data) is because the itemlinks do not tell you which set and chapter they are via API. I am very interest , how do you get all item id ?? copy by yourself? load eso game? UESP? Last edited by jellyalex978 : 04/15/19 at 01:36 AM. I doubt its new, but I am having crafters on 3 accounts and when pre-crafting items for research on my main acc, it would be cool to be able to get insight to the researched/non-researched items of my other accounts. I imagine a dropdown above the chars-window when clicking on the name of actual char, where u can swap accounts. I may consider it. I'm surprised you aren't throwing a fit that I "stole" this addon (while crediting the previous authors), though. I am using FCM Quest Tracker. CS shouldn't be doing anything that can forcibly close the window on exit. I see that it claims to be compatible with CS, which suggests it is responding to CS, rather than CS itself doing something. One thing I forgot to mentioned was that when I use a crafting station in any town this does not happen. Sorry about leaving that out of my original post. When home crafting stations were introduced, nothing was added to CS to handle them, so it should handle them identically. I don't know what the issue is. Provisioning recipes and motifs seem to be the only ones being marked when needed or needed by others on the account. None of the other patterns, formulae, etc are being marked. Is this intended or a known issue? It is indeed intended. That's what the blueprint tracking checkbox is for. Clearly I overlooked that checkbox somehow. Thanks for the heads up, all is good now! there are two small bugs in the style_map for the Yokudan style and Scalecaller style. The id for the Yokudan book is 57605 and not 57065, which is an id for an recipe . And the id for the crown book of Scalecaller is 134786 and not 134788. I've had a similar (but different) issue mentioned to me only once before and I could not reproduce it. This is the actual journal or the little one in the corner you can cycle through? Last edited by Snow : 04/11/19 at 04:26 AM. I realized this dismatching sound as well. And I do not use Craftstore. It seems that some items simply do not have assigned the right sound. I know that if i install craftstore NEW and delete the savevariables the sound is there. After some days the sound is gone. Where I can assigned a sound? ?